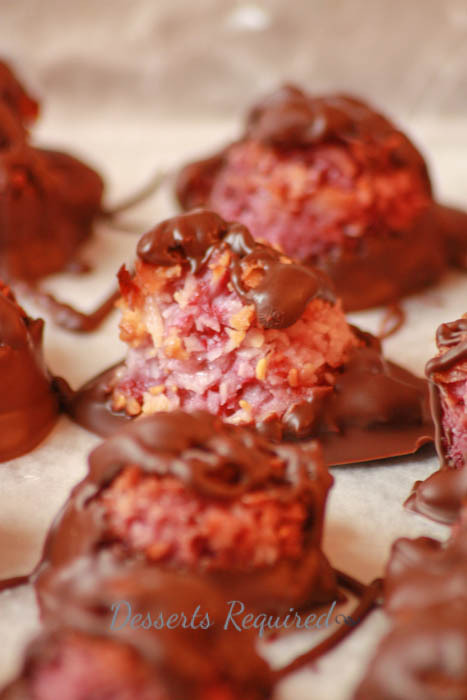 Chocolate Dipped Raspberry Coconut Macaroons are a sure sign that Passover is around the corner. Flour and other leavening agents are forbidden during this 8-day holiday but this does not mean that taste and beauty in desserts need be compromised. I have blogged about Chocolate Dipped Coconut Macaroons and Chocolate Macaroons and Coconut Macaroons and Almond Coconut Dream in the past but wanted something new and fresh this year. I love the combination of raspberries and coconut. Throw some chocolate into the equation and I am in food heaven. One thing that I have come to realize is that Passover is crunch time. There just aren’t enough hours in the day to prepare everything and I am not willing to skimp on dessert. 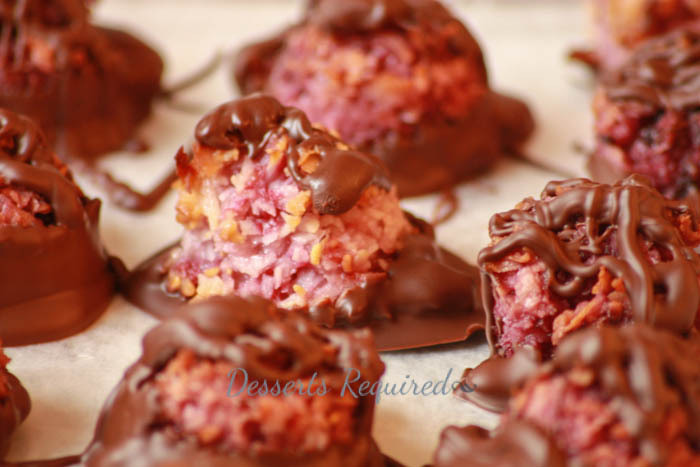 Chocolate Dipped Raspberry Coconut Macaroons are probably one of the easiest cookies I have made. The cookie ingredients are mixed together in a food processor, leaving a gorgeous pink color from the raspberries. Scoop the mixture onto a parchment lined baking pan and bake. The chocolate is not required but I for one could never contemplate leaving it out! The chocolate is melted with vegetable oil before the cooled cookies are dipped in it so that the bottoms are enrobed in chocolate. I like to drizzle a bit on top, too. 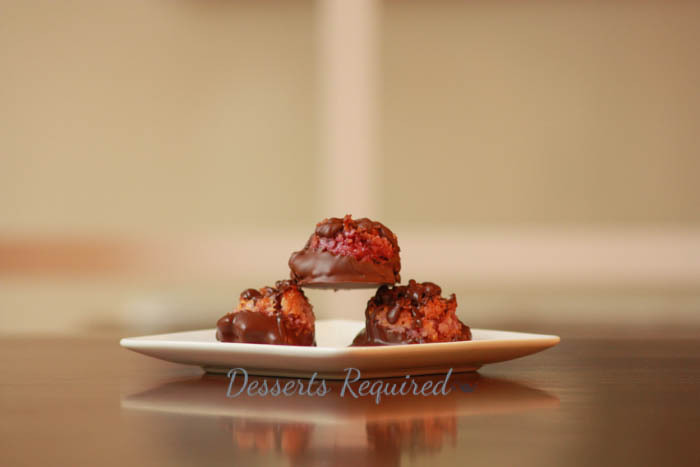 Whether you include Chocolate Dipped Raspberry Coconut Macaroons at your Seder or not is up to you. The bottom line is that these are delicious enough to eat year round. Actually, now that I think about, these gorgeous pink cookies are, also, perfect for Easter. I almost forgot to mention…they are, also, fabulous if you use blackberries. I LOVE options! Speaking of options, I am thrilled that Peter from Feed Your Soul Too is sharing his delicious Passover Flourless Chocolate Cake. Be sure to head over and check it out! Place the coconut, sugar, salt and egg white into a food processor fitted with the metal blade. Pulse on/off until the mixture is well combined. Add the raspberries and pulse on/off just until the berries are mixed in. You do not want them pureed. Use a small cookie dough scoop (about 1 tablespoon) to transfer the mixture to the prepared baking sheet. Bake at 350° for 28-30 minutes. The tops will look dry and will be lightly browned. Remove from the oven and cool completely on the baking sheet. Once cool, melt the chocolate and vegetable oil together in the microwave. Heat until the chocolate is almost melted and then stir to fully melt. 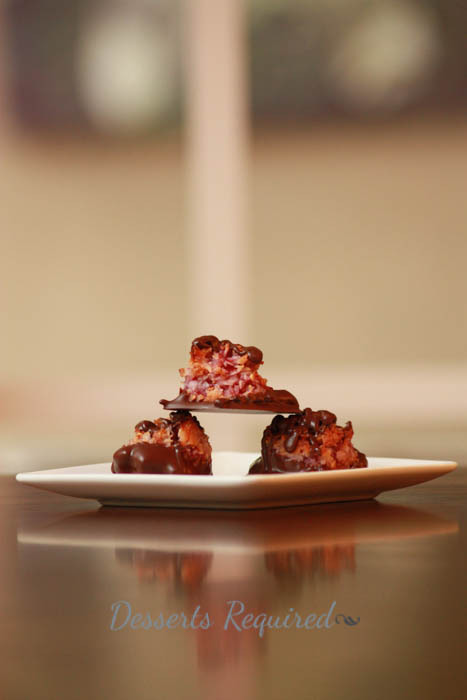 Dip each macaroon into the chocolate so that the bottom is enrobed in chocolate. Drizzle the remaining chocolate over the tops of the macaroons. Store in the refrigerator for a couple of days, if they last that long. Blackberries may be substituted for the raspberries. Better yet, make two batches…one of each. If you really want to go 'chocolate crazy', double the amount of chocolate called for and dip the entire cookie. I love the flavors in your macaroons and a really cool pic too. Thanks so much for your comment and for sharing this post with me. I had a lot of fun! Coconut , raspberry and chocolate ummmmm yum !! I love coconut and love the pink color do the mavaroons. Oh wow! Those look fabulous! Anything chocolate-dipped is a winner in my book! 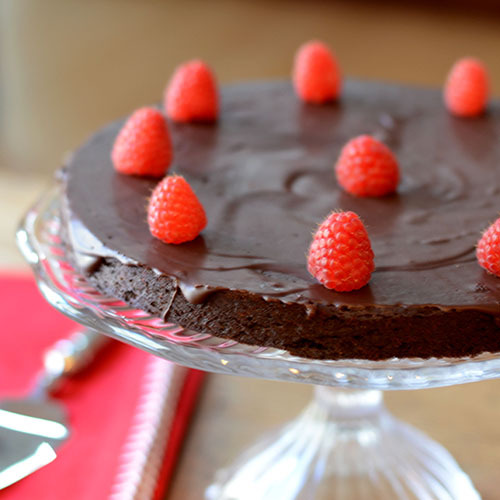 I’m with you all the way – I love the combination of raspberries coconut and chocolate. These look lovely! Thanks so much. It is a delish combination! They can. The chocolate may bloom a bit from the freezer so I would recommend dipping them post freezing.